It was wonderful to see everyone at Reunion in June. If you were not able to join us, don’t worry — our 10th will be here before we know it! Michael Carnow directed “Deliver Us from Nowhere,” a production of Chicago’s Tympanic Theatre that consists of 10 new works inspired by Bruce Springsteen’s seminal album ”Nebraska.” Since moving to Chicago in 2011, Michael has worked with Tympanic, Profiles Theatre and Chicago Dramatists. He is also literary manager at Profiles Theatre. He has worked with a variety of playwrights to help develop their new work, including Brandeis alums Sam Zelitch ’09 and Cassie Seinuk ’09. Prior to moving to Chicago, Michael was an artistic partner of Breathe Art Theatre in Detroit and was nominated for a Wilde Award for best production of a new script. He lives in the northern part of the city with his wife, Abby Reiss Carnow, and their dog, Miles. 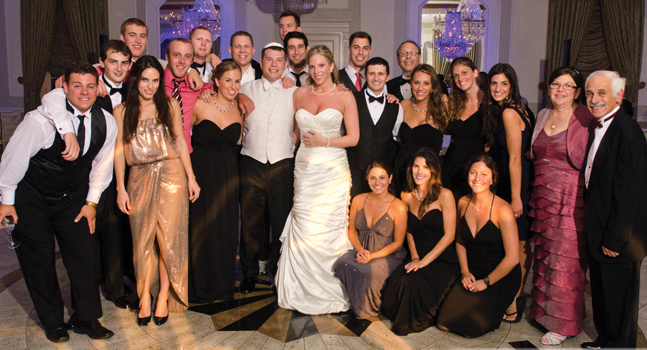 Nearly two dozen Brandeis alumni attended the wedding of Marissa Rubin and Brandon Pick ’08 on Aug. 28, 2011 (the middle of Hurricane Irene!) at The Rockleigh in Rockleigh, N.J. The Brandeis contingent included Mike Alfego ’09; Geoffrey Belinfante ’69, M.F.A.’71; Judy Belinfante ’72; Tzlil Castel ’08; Malcolm Cone-Coleman ’08; Rachel Cooper; Joe Coppens ’08; Remy Coyle ’07; Ben Leit ’08; Nadine Feingold-Studnik ’08; Patrick Mathews ’08; Danielle Mayer ’08; Brian Price ’08; Tyler Robinson ’08; Lee Rubin ’00; Jessa Saidel; John Saucier ’08; Chuck Sheehan ’08; Abby Shoolman; and Kate Streilein ’08. Marissa is a digital marketing specialist at Crain Communications’ BtoB Magazine, and Brandon is an associate at wealth adviser BBR Partners and is pursuing his M.B.A. at Baruch College. They live in Great Neck, N.Y.
A romantic whirlwind. Marissa Rubin ’07 married Brandon Pick ’08 on Aug. 28, 2011, at The Rockleigh in Rockleigh, N.J., during Hurricane Irene. More than 20 Brandeis alumni battled the elements to attend: (from left) Mike Alfego ’09; Malcolm Cone-Coleman ’08; Nadine Feingold-Studnik ’08; Patrick Mathews ’08; Tyler Robinson ’08; Joe Coppens ’08; Remy Coyle ’07; Lee Rubin ’00; Brandon; Marissa; Brian Price ’08; John Saucier ’08; Ben Leit ’08; Chuck Sheehan ’08; Richard Aaron; Danielle Mayer ’08; Kate Streilein ’08; Rachel Cooper ’07; Abby Shoolman ’07; Tzlil Castel ’08; Jessa Saidel ’07; Judy Belinfante ’72; and Geoffrey Belinfante ’69, M.F.A.’71.